Are you ready to be surprised by the Azores? The archipelago in the middle of the Atlantic Ocean is often forgotten. The Portuguese islands are nearly a 1,000 miles west of Lisbon and more than 1,000 miles southeast of Newfoundland. Basically, they’re in the middle of nowhere. More people stop here to refuel on long-haul trips than come to vacation. But maybe it’s time to rethink the beautiful, volcanic Azores. São Miguel, the largest and the most populated of the nine Azores, is known as the Green Island. It’s lush, green–hence the nickname–and has an ideal subtropical climate for growing pineapples, tea, and tobacco. Volcanic activity created craters, which turned into lakes, around the island. 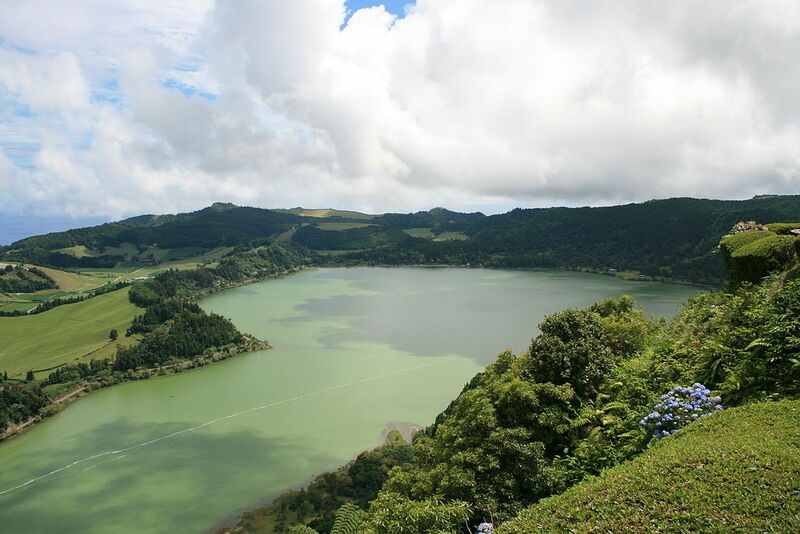 Furnas Lake is so stunning that people call the area Vale Formoso, or Beautiful Valley. 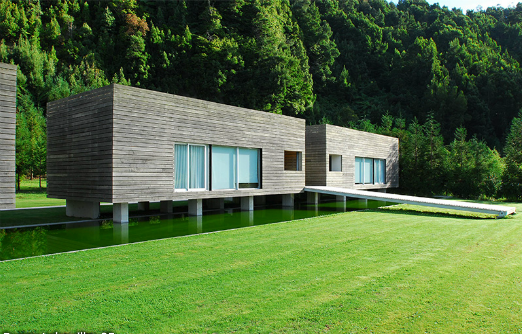 It’s here that you’ll find the Furnas Lake Villas. The ten apartment-style cottages are strikingly modern. The minimal, stilted cottages are decorated with bright pops of color. Porches have panoramic views of the green hills. And a pile of firewood ensures you’ll be comfortable at night. Take a chilly, early morning swim in the pool. It will probably just be you and a few Goldcrests up this early. Have breakfast delivered to your room. You’ll fill up on Azorean cheese, ham, bolo lêvedo (an addicting sweet bread), and homemade lemonade. Don’t forget the local tea. Following breakfast, climb the Pico do Ferro trail. A narrow footpath leads you down the cliff, past pumice cones and lava domes, to the caldeiras (hot springs). You’ll see buzzards, herons, and maybe even Azorean bats–oddly, they feed during the day–along the way. Ginger lilies, azaleas, and hydrangeas bloom alongside the water. The yellow crust on the ground is sulfur; you can’t miss the smell. And steam pushes up through holes in the ground, causing bubbles in the water and hot spots on the shore. After spending the morning canoeing, mountain biking, or horseback riding around the lake, relax in a thermal water pool at Terra Nostra Garden in town. The hot water is filled with energy restoring minerals. And then eat cozido, a meat-and-vegetable stew made using the steam from the lake, at Caldeiras & Vulcoes Restaurante. Maybe you won’t need to build a fire tonight, after all. This beautiful valley is only part of São Miguel. There are still beaches, wineries, and coastal stops with never-ending ocean views to explore. The Azores are no longer a pit stop.